For other uses, see Whitey Ford (disambiguation). Edward Charles "Whitey" Ford (born October 21, 1928), nicknamed "The Chairman of the Board" is an American former professional baseball pitcher who spent his entire 16-year Major League Baseball (MLB) career with the New York Yankees. He was voted into the Baseball Hall of Fame in 1974. Ford is a ten-time MLB All-Star and six-time World Series champion. Ford won both the Cy Young Award and World Series Most Valuable Player Award in 1961. He led the American League in wins three times and in earned run average twice. The Yankees retired Ford's uniform number in his honor. In the wake of Yogi Berra's 2015 death, George Vecsey writing in the New York Times, suggested that Ford is now "The Greatest Living Yankee." Ford was a native of the Astoria neighborhood of Queens in New York City, a few miles by the Triborough Bridge from Yankee Stadium in the Bronx. He graduated from the Manhattan High School of Aviation Trades. 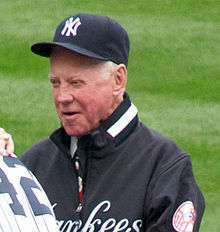 Ford was signed by the New York Yankees as an amateur free agent in 1947, and played his entire career with them. He was nicknamed "Whitey" while in the minor leagues for his light blond hair. During the Korean War, in 1951 and 1952 Ford served in the Army. 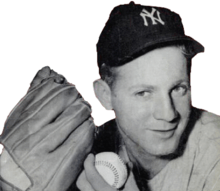 He rejoined the Yankees for the 1953 season, and the Yankee "Big Three" pitching staff became a "Big Four", as Ford joined Allie Reynolds, Vic Raschi and Eddie Lopat. 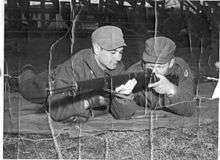 Whitey Ford (right) Shooting a rifle in training for the military. Eventually Ford went from the No. 4 pitcher on a great staff to the universally acclaimed No. 1 pitcher of the Yankees. He became known as the "Chairman of the Board" for his ability to remain calm and in command during high-pressure situations. He was also known as "Slick," a nickname given to him, Billy Martin and Mickey Mantle by manager Casey Stengel, who called them Whiskey Slicks. Ford's guile was necessary because he did not have an overwhelming fastball, but being able to throw several other pitches very well gave him pinpoint control. Ford was an effective strikeout pitcher for his time, tying the then-AL record for six consecutive strikeouts in 1956, and again in 1958. Ford pitched 2 consecutive one-hit games in 1955 to tie a record held by several pitchers. In 1955, Ford led the American League in complete games and games won; in 1956 in earned run average and winning percentage; in 1958, in earned run average; and in both 1961 and 1963, in games won and winning percentage. Ford won the Cy Young Award in 1961; he likely would have won the 1963 AL Cy Young, but this was before the institution of a separate award for each league, and Ford could not match Sandy Koufax's numbers for the Los Angeles Dodgers of the National League. He would also have been a candidate in 1955, but this was before the award was created. Some of Ford's totals were depressed by Yankees manager Casey Stengel who viewed Ford as his top pitching asset, and often reserved his ace left-hander for more formidable opponents such as the Tigers, Indians, and White Sox. When he became manager in 1961, Ralph Houk promised Ford he would pitch every fourth day, regardless of opponent; after exceeding 30 starts only once in his nine seasons under Stengel, Ford had 39 in 1961. His first 20-win season, a career-best 25-4 record, and the Cy Young Award ensued, but Ford's season was overshadowed by the home run battle between Roger Maris and Mickey Mantle. As a left-hander, Ford was also deft at keeping runners at their base: He set a record in 1961 by pitching 243 consecutive innings without allowing a stolen base. In May 1963, after pitching a shutout, Ford announced he had given up smoking. He said, "My doctor told me that whenever I think of smoking, I should think of a bus starting up and blowing the exhaust in my face." Ford won 236 games for New York (career 236-106), still a franchise record. Red Ruffing, the previous Yankee record-holder, still leads all Yankee right-handed pitchers, with 231 of his 273 career wins coming with the Yankees. Other Yankee pitchers have had more career wins (for example, Roger Clemens notched his 300th career victory as a Yankee), but amassed them for multiple franchises. David Wells tied Whitey Ford for 13th place in victories by a left-hander on August 26, 2007. Among pitchers with at least 300 career decisions, Ford ranks first with a winning percentage of .690, the all-time highest percentage in modern baseball history. Ford's career winning percentage cannot be attributed just to being on a good team: The Yankees were 1,486-1,027 during his 16 years; without his 236-106, they had 1,250 wins and 921 losses, for a won-loss percentage of .576. Ford was thus 11.4 percentage points higher than his team's record, independent of his record. Ford's 2.75 earned run average is the second-lowest among starting pitchers whose careers began after the advent of the live-ball era in 1920. (Only Clayton Kershaw's current 2.51 ERA is lower.) Ford's worst-ever ERA was 3.24. Ford had 45 shutout victories in his career, including eight 1-0 wins. Ford's status on the Yankees was underscored by the World Series. Ford was New York's Game One pitcher in 1955, 1956, 1957, 1958, 1961, 1962, 1963, and 1964. He is the only pitcher to start four consecutive Game Ones, a streak he reached twice. In the 1960 World Series against the Pittsburgh Pirates, Stengel altered this strategy by holding Ford back until game three, a decision that angered Ford. The Yankees' ace won both his starts in Games Three and Six with complete-game shutouts, but was then unavailable to relieve in the last game of a Yankees loss, the Pirates winning the game—and the Series with it—on Bill Mazeroski's walk-off home run in the bottom of the ninth. Ford always felt that had he been able to appear in three of the games instead of just two, the Yankees would have won. Ford appeared on eight AL All-Star teams between 1954 and 1964. Whitey Ford's number 16 was retired by the New York Yankees in 1974. Ford ended his career in declining health. In August 1966, he underwent surgery to correct a circulatory problem in his throwing shoulder. In May 1967, Ford lasted just one inning in what would be his final start, and he announced his retirement at the end of the month at age 38. Ford wore number 19 in his rookie season. Following his return from the army in 1953, he wore number 16 for the remainder of his career. After retiring, Ford admitted in interviews to having occasionally doctored baseballs. Examples were the "mudball", used at home in Yankee Stadium. Yankee groundskeepers would wet down an area near the catcher's box where the Yankee catcher Elston Howard was positioned; pretending to lose balance, Howard would put down his hand with the ball and coat one side of the ball with mud and throw it to Ford. Ford sometimes used the diamond in his wedding ring to gouge the ball, but he was eventually caught by an umpire and warned to stop. Howard sharpened a buckle on his shinguard and used it to scuff the ball. Ford described his illicit behavior as concession to age: "I didn't begin cheating until late in my career, when I needed something to help me survive. I didn't cheat when I won the twenty-five games in 1961. I don't want anybody to get any ideas and take my Cy Young Award away. And I didn't cheat in 1963 when I won twenty-four games. Well, maybe a little." Ford admitted to doctoring the ball in the 1961 All Star Game at Candlestick Park to strike out Willie Mays. Ford and Mantle had accumulated $1200 ($9,403 today) in golf pro shop purchases as guests of Horace Stoneham at the Giants owner's country club. Stoneham promised to pay their tab if Ford could strike out Mays. In 1977, Ford was part of the broadcast team for the first game in Toronto Blue Jays history. In 2008, Ford threw the first pitch at the 2008 Major League Baseball All-Star Game. On September 21, 2008 Ford and Yogi Berra were guests of the broadcast team for the final game played at Yankee Stadium. In 2002, Ford opened up "Whitey Ford's Cafe", a sports-themed restaurant and bar next to Roosevelt Field Mall in Garden City, New York. A replica of the Yankee Stadium facade trimmed both the exterior and the bar, whose stools displayed uniform numbers of Yankee luminaries; widescreen TVs were installed throughout. The main dining area housed a panoramic display of Yankee Stadium from the 1950s, specifically a Chicago White Sox–Yankee game with Ford pitching and Mickey Mantle in center field; the Yanks are up 2-0. Waiters and waitresses dressed in Yankees road uniforms, with Ford's retired No. 16 on the back. It lasted less than a year before it closed down. As of 2015, the 86-year-old Ford was splitting his time between his homes in Long Island and Florida. In a 1997 episode of The Simpsons, "The Twisted World of Marge Simpson", an animated Ford, "pleading with the crowd for some kind of sanity", was knocked unconscious by a barrage of pretzels at a baseball game. Homer suggests that the pretzels be rebranded "Whitey Whackers." In 1998, Grammy Award winning musician Everlast scored great success with his CD entitled Whitey Ford Sings the Blues. 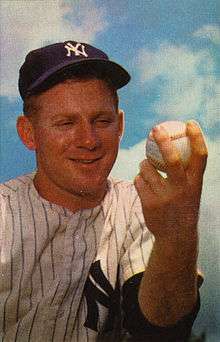 Ford was portrayed by Anthony Michael Hall in the HBO movie, 61* (2001), about Roger Maris and Mickey Mantle's 1961 quest to break Babe Ruth's single-season home run record. It was directed by Billy Crystal. He had a cameo appearance in Remington Steele starring Pierce Brosnan. Whitey Ford's plaque at Monument Park in Yankee Stadium. 1974, Ford and Mickey Mantle were both elected to baseball's Hall of Fame; at that time, the Yankees retired his number 16. In 1999, Ford ranked 52nd on The Sporting News List of Baseball's Greatest Players. He was nominated that year for the Major League Baseball All-Century Team. 2003, Ford was inducted into the Nassau County Sports Hall of Fame. 1994, a road in Mississauga, Ontario (Canada) was named Ford Road in his honor. The north-central area of Mississauga is known informally as "the baseball zone", as several streets in the area are named for hall-of-fame baseball players. ↑ Some sources, such as Retrosheet, claim a 1926 birthdate. "Whitey Ford". Retrosheet. Retrieved October 22, 2008. ↑ Berkow, Ira. "ON BASEBALL; Ford Highlight Film Started Early", The New York Times, August 17, 2000. Accessed November 3, 2007. "Vivid in my memory is Stengel's shrug, palms up at his sides, gesturing in response to the mixture of cheers for Ford and boos for his removal. It was a display of sympathy for the kid from Astoria, Queens, who just a few years earlier was playing in street stickball games, and now under a national spotlight and World Series pressure had pitched so beautifully." ↑ "They Came from Queens", Queens Tribune. Accessed November 4, 2007. "He once lived in Little Neck and attended Aviation High School." ↑ Ford, Whitey. Slick: My Life In And Around Baseball, New York: William Morrow, 1987. ↑ Details of Whitey Ford's Cafe from Yahoo! Local. ↑ Peter M. Gianotti, Review of White Ford's Cafe from Newsday, October 13, 2002. ↑ Conversation with present owner of Gasho of Japan restaurant, former site of Whitey Ford's Cafe.